What Home Inspectors Look For When They Inspect the Furnace. 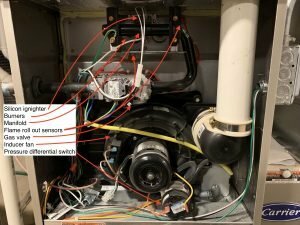 | Chicagoland Home Inspectors Inc.
Home > Blog > Heating > Forced Air Furnaces > High Efficiency > What Home Inspectors Look For When They Inspect the Furnace. What Home Inspectors Look For When They Inspect the Furnace. The above video shows a start up sequence of a condensing furnace, more commonly known as a high efficiency furnace. The video starts with the inducer fan already running. The computer in the furnace sends power to the inducer fan. It does not know if the fan is working or not. At the bottom of the video you will see two round disks. It is hard to tell that there are two of them because they are back-to-back and look like only one. There is a yellow wire leading to them. These are pressure differential sensors/switches. 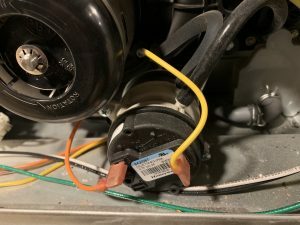 If the fan is spinning, it will create a positive pressure in the exhaust tube and a negative pressure inside the heat exchanger. These switches sense that difference in pressure and tells the computer that the inducer fan is spinning and a draft is induced. After the computer gets this signal, it will begin the next step of lighting the fire. Towards the top you will begin to see an orange glow. This is the igniter heating up and getting ready for the gas flow. After a few seconds, the computer will send gas to the burners. If the gas ignites, it will begin to make heat. 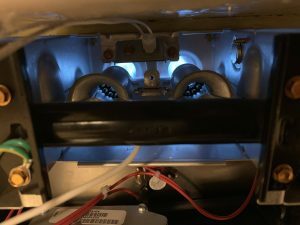 There is a heat sensor by the burners. This is called the fan limit switch, aka high limit switch. If the heat is not sensed by this switch within a few seconds, the computer will shut off the gas and stop the unit from starting. After the switch proves to the computer that the fire is ignited, then the circulation fan will start. These furnaces are engineered to transfer the heat created by the fire into the home. The fire creates a specific amount of BTU’s (British Thermal Unit). The heat exchanger is designed to allow the heat to transfer to the circulation air without letting any of the byproducts such as Carbon Monoxide (CO) enter the air we breath. As long as the heat is being absorbed at the proper rate, the furnace will continue to run until the desired temperature at the thermostat is reached. The fan limit/high limit sensor measures this. The designed temperature rise will be written on the data plate of the furnace. On these furnaces, it is usually about 30 to 60 degrees. The high limit set on most furnaces is about 190 degrees. This is also stated on the data plate of the furnace. If the temperature of the furnace air flow reaches this number, the furnace shuts down. Heat this high and higher can cause a fire. The first thing home inspectors check for is the proper operation, or sequence of operation, of the furnace. If the furnace can complete a startup cycle and reach the desired temperature of the thermostat, then the furnace computer thinks everything is okay. We also do temperature rise readings on the furnace to make sure it is within the range stated on the data plate. We also use equipment to read how much CO the flame is producing. This helps us determine how well the furnace is tuned and can also tell us exactly how efficient the unit is operating. When I started in this profession, every furnace was a natural draft furnace. We used mirrors and a flashlight to look for holes and cracks in the heat exchangers. Nowadays we cannot see inside the heat exchangers because of their designs. This is why we use the equipment that we use. Charles is a home inspector and a home inspector trainer. He started as a professional home inspector in 1993. He works for Chicagoland Home Inspectors, Inc. and Bellman Group, Inc. He has earned the title of Certified Master Inspector (CMI) from the Master Inspector Certification Board. He earned the title Certified Property Inspector (CPI) from the International Association of Certified Home Inspectors. He earned the title ASHI Certified Inspector (ACI) from the American Society of Home Inspectors. He served as a Director and Officer of the American Society of Home Inspectors. 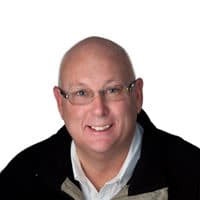 He hs a tremendous passion about the home inspection profession and prides himself on helping his clients with the biggest purchase of their lives. What Are the Biggest Causes of Damage to a Home’s Exterior?